(By Nino Orto)From the top of Mount Bental, in the Israeli side of the Golan Heights, the landscape below the hill is wild and beautiful while farmers are busy at their work on the grape trees under the skyline of the massive Mount Hermon. Only the occasional sound of machine-gun fire and the smoke that arises from the Syrian village of Quneitra reminds that you are less than two miles away from the worst war of the twenty-first century. Tourists from all over the world have come here to have a chance to witnesses clashes on the Syrian side of the border and bring home a small experience of a real war from a comfortable view. Nevertheless, there is not the same feeling for the people living there. “We are looking to Syria with concern because of the evolution of the conflict and the growing Iranian presence in the country during the last year,” says Avi Zeira, Head of Golan Heights Community, the biggest association in the zone that includes twenty-thousands Israelis living along the borders of Syria and Lebanon. Since 2011, the bloody civil war erupted between the Syrian Army and rebels have caused more than five-hundred thousand dead and almost twelve million Syrians were forcibly displaced from their home. After six years, little has remained of the country, and the wide support of Russia and Iran towards Bashar al-Assad in the conflict has complicated Israel’s geopolitical scenario in the Golan. 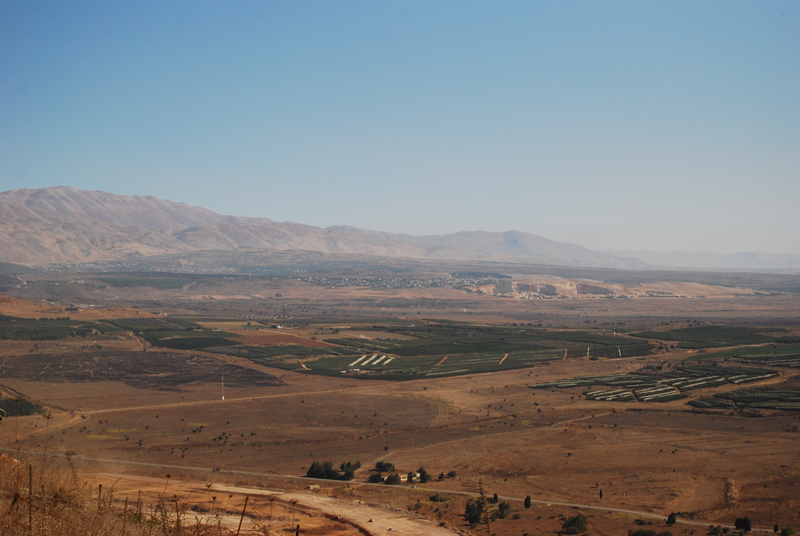 The Golan Heights, a territory took by Israel in 1967 from Syria during the Six Day War has for decades been the quietest border since the 1973 Yom Kippur and even after the outbreak of the Syrian Civil war, tourism, farms, and high-tech companies have continued to flourish in this part of the country. However, in the last year, the change in the balance of power in the Arab country and the victorious advance of the Syrian Army towards the north-west part of the nation have raised concerns amongst the Israeli government regarding this strategic plateau. Damascus has always claimed its rights to this territory but the outbreak of the revolution and the war against Islamist groups have kept Damascus busy on others. However, following the ingress of Iran and the Hezbollah, the Lebanese Shiite militia, Syria has gradually become a military hub where their presence has increased and changed the nature of the conflict. “We are here to maintain the Israel sovereignty on the Golan. This means that we are not just to live but to create a reality through development project that cannot be reversed whatever will happen. And here we will stay” says Mr. Zeira about the Israeli’s ability to stand against every attack from the region. The counter-offensive against major ISIS’s stronghold has allowed Iran and Hezbollah alliance to take back a significant chunk of the country and, in particular, the Lebanese military wing has emerged from the conflict stronger and more powerful than ever, achieving military expertise and new weapons from its patron, Iran. Thus, Golan Heights is becoming a part of a new scenario because the steady advance of the militia in the region can create, for the very first time, a territorial contiguity between Israel and Iran-related forces. “Assad is a puppet: the real problem is the strong presence of Iran close to our border in the Golan. We are prepared for anything can happen in the future and we will stand here because its strategic position on the intersection of Syrian-Lebanese borders is fundamental to Israel’s security” says Mr. Zeira confident. The recent military exercise (the largest in 19-year around the northern border) is a strong message to Iran and Hezbollah and has demonstrated the high level of alert that Israel is giving to this matter. The intent to establish a new hot-spot against Israel in the Golan has been an Iranian and Syrian goal since 2013, and has been quickly implemented in the past two years. During this time, there have been many operations to collect intelligence in the Golan Heights and to test the Israeli’s reaction with rocket fire, roadside bombs, drones, although Israel has always claimed that such operations have been conducted by Iranian and Hezbollah operatives. “We will never accept an Iranian-Hezbollah presence close to our border even if this will mean war” says Uzi Rabi, Director of Moshe Dayan Center for the Middle East and African Studies at Tel Aviv University. “This should be clear to everyone that Israel will not stay silent on the Iranian attempts to create a new front against us” he stated during our interview. Iran’s deployment on the Israeli border has many implications for the outbreak of a new war in the region and the consequences of such a type of conflict. There is a possibility that any local clash could quickly develop into a regional conflict, since Iran now has a strong presence in a strategic region that stretches from Iran to Lebanon through Iraq and Syria. In the last six years, Israel has played a role of silent observer from outside, with occasional strikes against Iranian weapon-convoys to Hezbollah and Syrian military facilities. Nevertheless, the uncomfortable position of outsider seems to become too tied now. Most because hundreds of thousands of Hezbollah rockets are ready to strike major Israeli cities anytime. Or the last aggressive statements by Iranian spiritual leader Alì Khameini and Hezbollah’s General Secretary Hassan Nasrallah point to an urgency to create a new alliance in order to stand against Israel and support the Palestinians. The options for Israel are becoming increasingly limited and there is growing evidence of how they are finding common ground with Arabic countries such as Saudi Arabia, Jordan and Egypt. This could open up new scenarios in the region. “Israel is looking for an alliance with Sunni states to create a common front against the Ayatollah. As Iran is quickly advancing and spreading its presence in Iraq, Syria, Lebanon, and Yemen has became clear this is not only Israel’s problem anymore” says Professor Rabi.